Background: Antibiotics are commonly prescribed in exacerbations of chronic obstructive pulmonary disease (COPD). However, the role of bacteria in these exacerbations is controversial. Objective: To identify clinical predictors of bacterial infection as a cause of exacerbation, considering the protected specimen brush (PSB) as the gold standard. Methods: Clinical data, sputum and PSB samples were collected from 40 patients with COPD requiring hospitalisation due to severe exacerbations who had not received previous antibiotic treatment. Results: Quantitative cultures of PSB samples (n = 40) yielded 23 potential pathogenic microorganisms (PPMs) at concentrations of ⩾102 colony-forming units/ml in 18 (45%) patients. Sputum samples were obtained from all 40 patients. Culture of good-quality sputum samples (n = 18) yielded 16 PPMs corresponding to 14 (35%) patients. The concordance between the PSB and sputum rate was high (κ = 0.85, p<0.002). The self-reporting patient observation of sputum purulence (odds ratio (OR) 27.20 (95% confidence interval (CI) 4.60 to 60.69), p = 0.001), the percentage predicted forced expiratory volume in 1 s (FEV1%) <50 (OR 2.27 (95% CI 1.55 to 3.21), p = 0.014), >4 exacerbations in the past year (OR 6.9 (95% CI 0.08 to 1.08), p = 0.028) and previous hospitalisations due to COPD (OR 4.13 (95% CI 1.02 to 16.07), p = 0.041) were associated with the presence of PPMs in the distal airways. The operative characteristics for predicting distal airway infection when patients presented with purulent exacerbation were as follows: sensitivity 89.5%, specificity 76.2%, positive predicted value 77.3% and negative predicted value 88.9%. Conclusions: The self-reporting presence of purulence in the sputum, as well as common previous exacerbations and hospitalisations due to COPD in patients with severe airflow obstruction (FEV1% <50) predict the presence of bacterial infection in the distal airways. The use of these clinical variables may help in selecting candidates to receive antibiotic treatment. 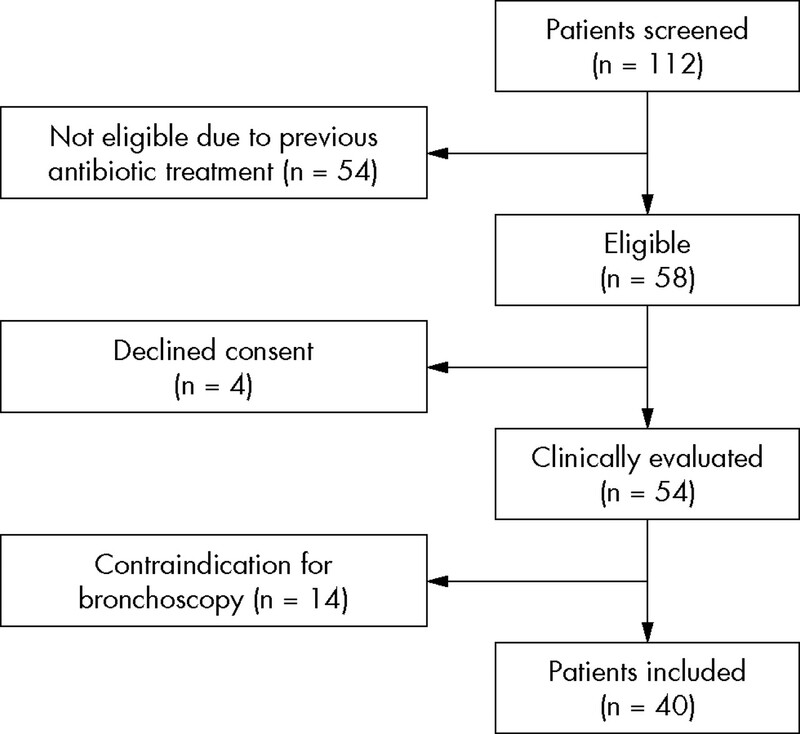 Quantitative culture of protected specimen brush (PSB) is considered the gold standard for the diagnosis of distal airway infections because of its potential for obtaining sterile microbial samples.9,10 However, the invasiveness inherent to the bronchoscopic evaluation precludes its use in clinical practice. In this sense, the identification of reliable clinical predictors of bacterial infection as a cause of severe exacerbations based on PSB findings might be of critical importance, as it would help to promote a more judicious use of antibiotics in this clinical setting. In this study on patients with severe COPD exacerbations requiring hospitalisation, we aimed to (1) identify potential, easy-to-obtain, clinical predictors of bacterial infection as a cause of exacerbation, taking PSB samples as the gold standard and (2) assess the role of sputum culture as an alternative diagnostic technique in this clinical setting. The study was conduced from October 2002 to April 2004 in a respiratory care unit at the Hospital Clínic, Barcelona, Spain. During this period, selected patients with COPD exacerbation requiring hospitalisation were screened for participation. Patients were evaluated within the first 24 h after admission to the emergency department. The ethics committee of the hospital approved the study protocol and written informed consent was obtained from each patient. COPD was defined and categorised according to the Global Initiative for Chronic Obstructive Lung Disease guidelines.11 Airflow obstruction was defined as a post-bronchodilatador ratio of percentage predicted forced expiratory volume in 1 s to forced vital capacity as a percentage of predicted (FEV1/FVC) of ⩽0.7. The degrees of obstruction were as follows: mild, FEV1% predicted ⩾80%; moderate, FEV1% predicted 50–80%; severe, FEV1% predicted 30–50%; and very severe, FEV1% predicted <30%. Patients with a bronchodilatador reversibility test >200 ml or >12% predicted were not included. Sputum purulence was considered when patients referred to a change in the colour of sputum over the past 72 h from uncoloured to yellow–green. Although guidelines for the diagnosis and care of patients with COPD were considered,2,11 the ultimate decision on whether patients required admission from the emergency department to the respiratory ward was taken by the pneumologist in charge after careful evaluation of their particular clinical characteristics and results of their biochemistry and arterial blood gases. All patients were reassessed clinically 4 weeks after discharge from hospital. Treatment outcome was judged successful when the patient did not have impairment in respiratory symptoms requiring additional outpatient visits, any increase in the baseline treatment or hospital readmission. Common exclusion criteria were as follows: (1) previous diagnosis of bronchiectasis; (2) clinical and radiological evidence of pneumonia or congestive heart failure; (3) necessity of mechanical ventilation on admission; (4) diagnosis of neoplasm or any type of immunosuppression; (5) previous hospitalisation during the past 4 weeks; and (6) any type of antibiotic treatment received over the 4 weeks before admission. Demographic data, evaluation of current symptoms, number of prior exacerbations requiring hospitalisation, relevant comorbid conditions, current treatment and stay in hospital were retrieved by means of a standardised questionnaire. Biochemical results, chest x ray films and arterial blood gas analysis were obtained in all patients at admission from the emergency department. A sample of spontaneous sputum for microbiological evaluation was obtained from all patients. Patients then received nebulised bronchodilatadors (albuterol sulphate 5 mg and ipratropium bromide 250 μg) and intravenous prednisolone. Bronchoscopy was performed within the first 24 h after admission. Upper airway anaesthesia was achieved by nebulisation of 8 ml of lidocaine 5% through a buccal clip for 15 min. Flexible bronchoscopy (Olympus BF 30; Olympus, New Hyde Park, New York, USA) was performed transnasally, avoiding any suction through the inner channel. Using the technique described by Wimberley et al,13 a PSB sample (Microbiology Brush; Mill-Rose Laboratory, Mentor, Ohio, USA) was obtained from a segmental orifice of the middle lobe or the right lower lobe. Oxygen supplementation was given to all patients by a nasal catheter. The following criteria were considered as formal contraindications to perform the bronchoscopy: (1) changes in mental status, (2) dyspnoea at rest and (3) severe or worsening hypoxaemia and hypercapnia with respiratory acidosis. Once bronchoscopy was performed, empirical antibiotic treatment (oral amoxicillin–clavulanate, oral levofloxacin, oral clarithromycin or intravenous ceftriaxone) was initiated and the regimen was later adjusted according to microbiological results obtained by PSB specimens. Antimicrobial treatment was not stopped in the case of negative microbiological findings. Microorganisms identified according to standard methods17 were classified as potential pathogenic microorganisms (PPMs), which included Haemophilus influenzae, Streptococcus pneumoniae, Moraxella catarrhalis, Gram-negative bacilli, Pseudomonas aeruginosa and Staphylococcus aureus, and non-potential pathogenic microorganisms (non-PPMs), which included Streptococcus viridans, Neisseria spp, Candida spp, Corynebacterium spp, H parainfluenzae and Staphylococcus epidermidis. Continuous variables are reported as medians (range). Continuous variables were compared using the non-parametric Mann–Whitney U test and categorical variables by the χ2 test or Fisher’s exact test when appropriate. All reported p values were two tailed and the level of significance was 5%; κ coefficient was used to measure the agreement between sputum and PSB samples. Only valuable sputum samples were considered for correlations with PSB. The potential influence of different variables on the presence of PPMs in the distal airways was evaluated by univariate analysis. The assessed variables were as follows: smoking habit (0, current smoker; 1, past smoker), pulmonary function (0, FEV1 ⩾50%; 1, FEV1 <50%), presence of comorbidities (0, no; 1, yes), previous oral corticosteroid (daily oral prednisone >10 mg) treatment (0, no; 1, yes), number of exacerbations in the past year (0, <4; 1, ⩾4), number of hospitalisations during the past 3 years (0, 0; 1, ⩾1); sputum characteristics (0, mucous; 1, purulent), fever at admission (0, no; 1, yes), arterial oxygen pressure (PaO2) at admission (0, ⩾60; 1, <60 mm Hg), arterial CO2 pressure (PaCO2) at admission (0, <45; 1, ⩾45 mm Hg), and white cell count at admission (0, <12×109/l; 1, ⩾12×109/l). Adjusted odds ratios (ORs) with 95% confidence intervals (CIs) were computed for variables associated with the presence of PPMs in the airways. All data were analysed using the statistical package SPSS for Windows V.10.0. During the study period, 112 patients with COPD exacerbations admitted to the emergency room and requiring hospitalisation were screened (fig 1), of whom 54 were excluded because they had received antibiotics in the previous month, 4 patients refused to undergo bronchoscopy, and in 14 patients this technique was considered too risky because of clinical and/or arterial blood gas deterioration. The median (range) predicted FEV1% was 37 (19–72), predicted FVC% was 75 (64–89) and FEV1:FVC% was 42 (34–67). In all, 21 (53%) patients were taking inhaled steroids (maximum 1600 μg/day) and 9 (23%) were receiving daily oral steroid treatment (maximum 10 mg/day). All patients complained of increased breathlessness at presentation, 20 (50%) had increased sputum volume and 22 (55%) reported purulent sputum over the 48–72 h before admission (table 1). We found no differences between patients with purulent exacerbations (n = 22) and those with mucoid exacerbations (n = 18) regarding age, smoking habit, forced spirometry data, use of domiciliary oxygen, presence of comorbidities, current inhaled drugs (β-agonists, ipratropium bromide or corticosteroids), PaO2 or PaCO2 values at admission, and days of hospitalisation. Bronchoscopy-guided PSB samples were obtained in the 40 patients included in the study. No serious complications during the bronchoscopy procedure were evidenced. Cultures of PSB at ⩾102 CFU/ml yielded 23 PPMs in 18 of 40 (45%) patients. The concentration reached a cut-off of ⩾103 in 13 of the 18 patients with PPMs in the PSB. Also, PSB cultures showed growth of 21 non-PPMs in 10 (25%) patients. The most frequent PPMs isolated were Streptococcus pneumoniae (n = 7, 17.5%), H influenzae (n = 7, 17.5%), Pseudomonas aeruginosa (n = 4, 10%) and M catarrhalis (n = 2, 5%). A sputum sample was obtained spontaneously from all 40 patients, but only 18 (45%) fulfilled the Murray–Washington criteria (grade IV or V) and were further processed for culture.13 Culture of good-quality sputum samples yielded 16 PPMs corresponding to 14 (35%) patients and 4 non-PPMs reported as mixed community flora corresponding to 4 (10%) patients (table 2). Four patients with considerable concentrations of PPMs in the PSB samples had a negative sputum culture. By contrast, only one patient with a positive sputum culture had a negative PSB specimen (fig 2). Accordingly, for the PPMs recovered above the predefined cut-off of ⩾102 CFU/ml, the results of PSB and sputum cultures agreed in 85% of the patients (κ = 0.85, p<0.002). Microbiological profile. PPM, potentially pathogenic microorganism; PSB, protected specimen brush. *All samples contained <25 neutrophils/low-power field. Serological samples were positive according to the established criteria in 7 of 39 (18%) cases, with 2 cases of Chlamydia pneumoniae, 2 cases of influenza A virus, and one case each of M pneumoniae, parainfluenza virus and respiratory syncytial virus. Two patients with serological evidence of Chlamydia pneumoniae infection had a concomitant H influenzae isolated in the PSB samples. Susceptibility tests to antibiotics were performed for the PPMs isolated by PSB. Of the 7 H influenzae strains isolated, 3 (43%) were β-lactamase positive and, of the 4 strains of M catarrhalis isolated, 3 (75%) were β-lactamase positive. Two strains of Streptococcus pneumoniae showed high resistance to penicillin (minimum inhibitory concentration (MIC) ⩾2 μg/ml), two strains had intermediate resistance (MIC 0.1–1.0 μg/ml) and only three strains were susceptible to penicillin (MIC ⩽0.06 μg/ml). The results of the univariate analysis showed that factors associated with the presence of PPMs in the distal respiratory tract were the self-reporting patient observation of sputum purulence (p<0.001), a severe airflow obstruction defined by a FEV1% <50% (p = 0.014), >4 exacerbations in the past year (p = 0.028) and being hospitalised at least once for COPD exacerbation over the last 3 years (p = 0.041) (table 3). Factors not related to the presence of PPMs in the lower airways were smoking habit, PaO2 and PaCO2 values at admission, previous domiciliary oxygen therapy and inhaled or oral steroid treatment. The results of the univariate analysis did not change when a cut-off of ⩾103 CFU/ml was considered. Of the 22 patients, 17 (77%) who reported a purulent appearance of the sputum had PPMs above the predefined cut-off point in the PSB sample, but only 5 (23%) of them had negative cultures. By contrast, only 1 patient who reported mucoid sputum had considerable PPMs in the PSB sample (fig 3). This was the only patient with a good-quality sputum sample that was further processed for culture. Using 102 CFU/ml in the PSB, the operative characteristics for predicting lower airway infection when patients reported the presence of purulent sputum were as follows: sensitivity 89.5%, specificity 76.2%, positive predictive value 77.3% and negative predictive value 88.9%. Likewise, the corresponding operative characteristics for the valid sputum cultures at admission were 72.2%, 89.4, 92.9% and 95.5%. Relationships between sputum characteristics and protected specimen brush (PSB) results of patients with chronic obstructive pulmonary disease (COPD). When Anthonisen criteria were analysed, 20 patients presented three cardinal symptoms at admission (type 1 exacerbations), 12 presented two criteria with sputum purulence in only two cases (type 2 exacerbations) and 8 patients presented one criteria, exclusively for increased dyspnoea (type 3 exacerbations). We found that the airway infection rate by PPMs in patients with exacerbation types 1, 2 or 3 was 80%, 35% and 6%, respectively. The effect of increased dyspnoea and increased sputum volume was negligible when analysing these two major criteria independently. This study shows that purulence in the sputum is the hallmark of bacterial airway infection in patients with COPD exacerbation. 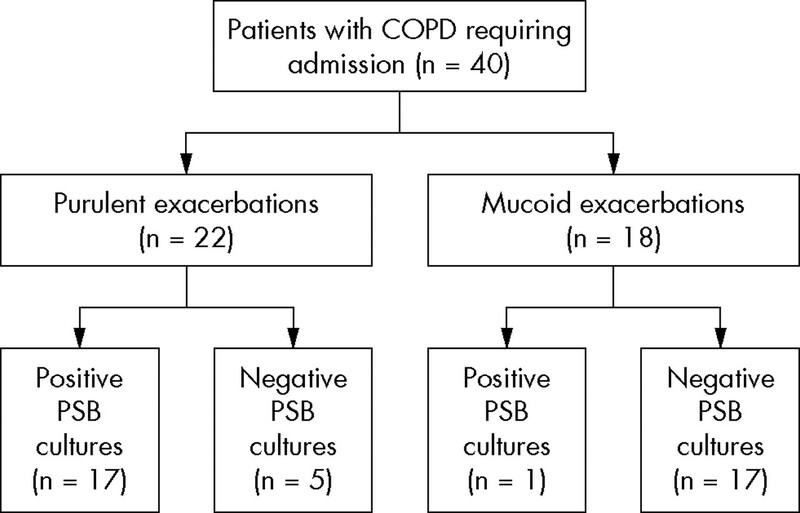 Contrary to patients with mucoid sputum, most of those who reported purulence had positive PSB cultures with high PPM counts in distal airways. This finding emphasises the usefulness of simple cardinal symptoms in selecting candidates to receive antibiotics, even in the context of severe exacerbations requiring hospitalisation. Different studies using sputum cultures have shown good correlations between purulence and bacterial exacerbations,20–22 but our study is the first using uncontaminated PSB specimens as a gold standard to define the presence or absence of distal airway infection. Interestingly, our results show that a self-reporting presence of purulence in the sputum predicts the presence of bacteria at high concentrations in the airways with a positive predictive value of 77% and a negative predictive value of 89%. Also, being hospitalised previously, >4 COPD exacerbations per year and a severe airway obstruction (FEV1 <50%) reinforce the probability of having high bacterial counts in the distal airways. Although these data seem to be reliable for deciding which patients should and which should not be treated with antibiotics, several precautions must be taken into account for the proper evaluation of these results. Firstly, we have not performed a multivariate analysis to better identify variables independently associated with the presence of high bacterial counts in the distal airways, because this method might be influenced by the small sample size of the population evaluated and the results obtained might be difficult to interpret. Secondly, our population comprised selected patients with severe COPD exacerbation who had not received antibiotics and who were fit enough to undergo a bronchoscopic exploration. Further, although PSB is considered a gold standard for defining infection in patients with pneumonia, there is a lack of technical standardisation for performing this technique in patients with COPD exacerbations. Finally, after bronchoscopy, all included patients were treated with antibiotics precluding any conclusion with regard to the outcome of the exacerbation. In this sense, our results must clearly be confirmed in properly designed clinical studies evaluating the response to antibiotics in unselected patients with and without the criteria of purulent sputum. Also, and as pointed out by Niederman, it is necessary to use end points other than bacteriological eradication, such as time to resolution of symptoms or disease-free intervals.23,24 The pathogenic role of bacteria in exacerbations is controversial. It is well known that bacteria chronically colonise the airways of some patients with COPD, but the mere presence of bacteria in airway secretions does not necessarily establish their aetiological role in exacerbation.25 We used quantitative cultures of PSB samples as a gold standard to define the presence or absence of bacterial infection.10 Recently, Rosell et al26 performed a pooled analysis of different studies that used PSB in patients with COPD.26 On the basis of the results obtained in 337 individuals (70 healthy people, 181 patients with stable COPD and 36 patients with exacerbations), these authors established a threshold of 102 CFU/ml as abnormal. The prevalence of positive cultures of ⩾102 CFU/ml was much higher in patients with COPD exacerbations than in those with stable COPD. Colonisation by PPMs was observed in almost 30% of patients with stable COPD, but a minimal proportion had bacteria in high concentrations. In our study, 13 of the 18 (72%) patients with PPMs above the predetermined threshold had counts of ⩾103 CFU/ml, a threshold that is normally used to define pneumonia. Also, our study is unique because the patients included had not received antibiotics over the past 4 weeks, further supporting the aetiological role of the bacteria isolated in the exacerbation. Likewise, knowing that a particular patient has had previous hospitalisations for COPD exacerbation, has had >4 exacerbations per year and has a severe airway obstruction (FEV1 <50%) may reinforce the decision to prescribe antibiotics. Contrary to Stockley et al,21 we did not perform an analysis of the colour of the sputum. Although we acknowledge the subjectivity inherent in self-reporting, it proved to be valuable. The sensitivity and specificity of the self-reporting presence of purulence in the sputum were 90% and 76%, respectively. Apart from its simplicity, the self-reporting criteria of the sputum characteristics have the added advantage that they can be evaluated in every patient. By contrast, in the series by Stockley et al21 and in our own series, 25% and 35% of the patients included, respectively, had sputum samples that were not processed for culture because their quality was considered unsatisfactory. On the other hand, Murphy et al27 used molecular typing to show that sputum cultures could underestimate the frequency of bacterial colonisation of the respiratory tract. This observation confirms the limitation of sputum culture as a valid technique to evaluate the role of bacteria in exacerbations. Purulence should be expected when bacteria are causing infection as the activation of host defences includes neutrophil recruitment to the airways. On the contrary, our results confirm that mucoid sputum rarely reflects bacterial airway infection. This finding is remarkable as in our series most of the non-valuable sputum samples for culture came from patients who reported mucous sputum, and clinicians may be afraid of not giving antibiotics to patients with an unsatisfactory sputum sample, although they have reported that it was mucoid. In this sense, our results support the findings by Stockley et al,21 showing that patients with mucoid sputum during the acute exacerbation improved without antibiotic treatment. In this study, we could only incriminate bacteria as a cause of the exacerbation in 45% of the episodes evaluated (patients with PPMs in high concentrations in the distal airways). Our results are in accordance with those of others investigations showing that only half of the episodes of exacerbation are bacterial in origin, whereas the remainder should be attributed mainly to viruses, and to a lesser extent to toxins and other environmental causes.28 The fact that in our series, 18% of the patients evaluated had positive serology in the presence of different respiratory viruses or had atypical bacteria further emphasises the role of these microorganisms in exacerbations, as Blasi et al29 have recently shown using molecular typing.29 The myriad of microorganisms that potentially cause an exacerbation in patients with COPD underlines the importance of properly selecting patients who are expected to benefit from antibiotic treatment. Our results show that 45% of the patients with a COPD exacerbation requiring hospitalisation have high concentrations of PPMs in PSB samples, suggesting a bacterial aetiology. We found that the self-reported observation of purulence in the sputum is strongly associated with the presence of bacterial COPD exacerbations. In addition, previous hospitalisations, >4 exacerbations per year and having severe air flow obstruction can predict the presence of high bacterial counts in the distal airways. The use of these simple parameters may help in selecting candidates to receive antibiotics; however, proper outcome-based studies are needed to confirm our results. Murray CJL, Lopez AD. Mortality by cause for eight regions of the word: Global Burden of Disease Study. Lancet1997;349:1269–76. Celli BR, MacNee W, and committee members. Standards for the diagnosis and treatment of patients with COPD: a summary of the ATS/ERS position paper. Eur Respir J2004;23:932–46. Sethi S. Infectious etiology of acute exacerbations of chronic bronchitis. Chest2000;117:S380–5. Patel IS, Seemungal TA, Wilks M, et al. Relationship between bacterial colonisation and the frequency, character, and severity of COPD exacerbation. Thorax2002;57:759–76. Saint S, Bent S, Vittinghoff E, et al. Antibiotics in chronic obstructive pulmonary disease exacerbations: a meta-analysis. JAMA1995;273:957–60. Kim S, Emerman Ch, Cydulka RK. et al Prospective multicenter study of relapse following emergency department treatment of COPD exacerbation. Chest2004;125:473–81. Lentino J-R, Lucks D-A. Non-value of sputum culture in the management of lower respiratory tract infections. J Clin Microbiol1987;25:693–7. Monsó E, Ruiz J, Rosell A, et al. Bacterial infection in chronic obstructive pulmonary disease: a study of stable and exacerbated outpatients using the protected specimen brush. Am Respir Crit Care Med1995;152:1316–20. Soler N, Torres A, Ewig S, et al. Bronchial microbial patterns in severe exacerbations of chronic pulmonary disease (COPD) requiring mechanical ventilation. Am J Respir Crit Care Med1998;157:1498–505. Pouwels R, Buist S, Calverley P, et al. Global strategy for the diagnosis, management and prevention of chronic obstructive pulmonary disease. NHLBI/WHO Global Initiative for Chronic Obstructive Lung Disease (GOLD) Workshop Summary. Am J Respir Crit Care Med2001;163:1256–76. Miravitlles M, Espinosa C, Fernández-Laso E, et al. Relationship between bacterial flora in sputum and functional impairment in patients with acute exacerbations of COPD. Chest1999;116:40–6. Wimberley N, Faling L-J, Bartlett J-G. A fiberoptic bronchoscopy technique to obtain uncontaminated lower airway secretions for bacterial culture. Am Rev Respir Dis1979;119:339. Murray P-R, Washington J-A. Microscopic and bacteriologic analysis of expectorated sputum. Mayo Clin Proc1975;50:339–44. National Committee for Clinical Laboratory Standards. Performance standards for antimicrobial susceptibility testing. Vol 17. Philadelphia, PA: NCCLS, 1997;1:M57–100. Cabello H, Torres A, Celis R, et al. Bacterial colonization of distal airways in healthy subjects and chronic lung disease: a bronchoscopic study. Eur Respir J1997;10:1137–44. Ballows A, Hauser WJ, Herrmann KL, et al.Manual of clinical microbiology. 5th edn. Washington, DC: American Society of Microbiology, 1991. De Roux A, Marcos MA, Garcia E, et al. Viral community-acquired pneumonia in immunocompromised adults. Chest2004;125:1343–51. Monsó E, Rosell A, Bonet G, et al. Risk factors for lower airway bacterial colonization in chronic bronchitis. Eur Respir J1999;13:338–42. Monsó E, Garcia-Aymerich, Soler N. et al Bacterial infection in exacerbated COPD with changes in sputum characteristics. Epidemiol Infect2003;131:799–804. Stockley RA, O’Brien Ch, Pye A. et al Relationship of sputum color to nature and outpatient management of acute exacerbations of COPD. Chest2000;117:1638–45. Eller J, Ede A, Schaberg T, et al. Relation between bacteriologic etiology and lung function. Chest1998;113:1542–8. Niederman MS. Who should receive antibiotics for exacerbations of chronic bronchitis? A plea for more outcome-based studies. Clin Infect Dis2004;39:987–8. Van der Valk P, Monninkhof E, Van der Palen J, et al. Clinical predictors of bacterial involvement in exacerbations of chronic obstructive pulmonary disease. Clin Infect Dis2004;39:980–6. Sethi S, Evans N, Grant B, et al. New strains of bacteria and exacerbations of chronic obstructive pulmonary disease. N Engl J Med2002;347:465–71. Rosell A, Monsó E, Soler N, et al. Microbiological determinants of exacerbation in chronic obstructive pulmonary disease. Arch Intern Med2005;165:891–7. Murphy TF, Brauer AL, Schiffmacher AT, et al. Persistent colonization by Haemophilus influenzae in chronic obstructive pulmonary disease. Am J Respir Crit Care Med2004;170:266–72. Rohde G, Wiethege A, Borg I, et al. Respiratory viruses in exacerbations of chronic obstructive pulmonary disease requiring hospitalisation: a case-control study. Thorax2003;58:37–42. Blasi F, Damato S, Consentini R, et al. Chlamydia pneumoniae and chronic bronchitis: association with severity and bacterial clearance following treatment. Thorax2002;57:672–6. Funding: This study was supported by Marató TV3 (04050530 and 04040210), grant FISS (PI041136 and PI030113), Red Gira (V-2003-REDG063-0), Red Respira (V-2003-REDC11B-0) and CIBER, CB 06/06/0028.